Magnolia flowers in soft colors. This Magnolia grows in our neighbors’ garden and I have made some nice pictures a few times. The colors are beautiful, because there are some very subtle variations, from warm pink to very light blue-purple, which almost looks like white, but is not completely white. 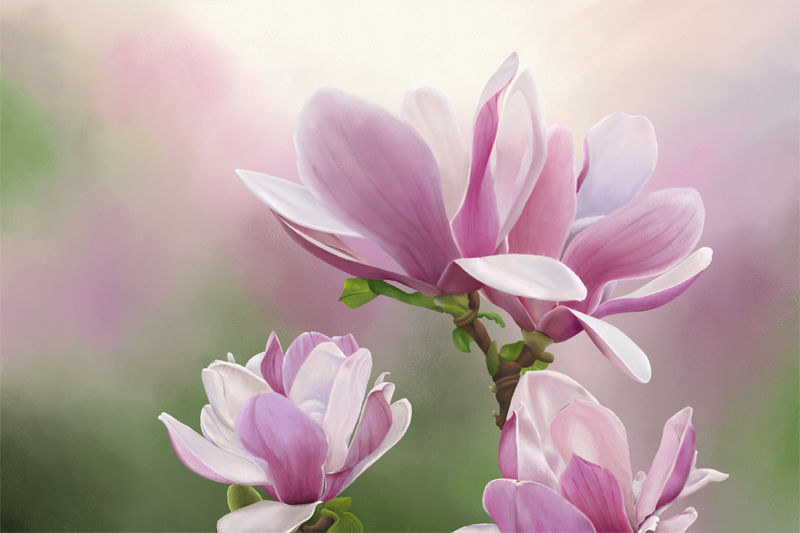 Similar to the painting of Japanese cherry blossoms, I ArtRage’s soft pastel tool, which leads to the fine transitions between colors, while still showing the structure of the “paper”. The painting is available in my Etsy shop as fine art giclée print in 3 different sizes. Via RedBubble it can be purchased as canvas print, poster, smartphone case, greeting card en much more.